Some of the most ill people I have tried to help have been diagnosed with Lyme disease. Conventionally, the diagnostic and treatment options are not good. Serological testing has been disappointing and confusing. The difficulties with long-term antibiotic protocols include the expense, lack of insurance coverage, side-effects, potential for development of resistance and lack of studies demonstrating efficacy. Countless people needlessly suffer from Lyme disease. After years of research I now present what I believe to be the most effective solution offered today. Due to the obvious and desperate need for an effective anti-Borrelia agent and that Advanced Cellular Silver (ACS) 200 by Results RNA® in previous studies has been proven to be a safe and effective anti-bacterial, anti-viral and anti-fungal agent, the following independent studies were conducted. Independent studies generated the following kill-time data using ACS 200 against Borrelia burgdorferi, the etiological agent of Lyme disease. 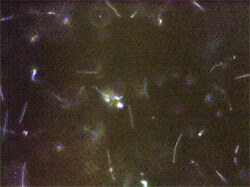 The kill-time studies used loss of motility of the spirochetes as the kill criteria as observed via dark field microscopy. It is important to know that the Borrelia burgdorferi kill-time protocol used for this test was originated by Dr. William Burgdorfer. The estimated volume of 1 field is approximately 3.4 x 106 ml. Therefore, the starting concentration of the Borrelia burgdorferi culture was approximately 3.8 x 107 organisms/ml. “I have been using the ACS 200 for well over a year and find that I rely on taking it daily. I have the Varestrongylus Klapowi worm that Lyme and CFS patients suffer with and I take 2 ounces, 3 times a week, and it has helped to get the worm under control. I also take 5 sprays by mouth, 3 times daily. ACS 200 is such an important part of my wellness program that I carry a bottle in my purse. It is also great for sinus infections, pink eye and ear infections. Make sure you hold the solution in your mouth for 3 to 5 minutes if you can. Lyme patients have severe dental problems and by holding each dose in your mouth, it helps our gums. I make sure I spray my mouth several times when out in public, especially the movie theater.” Linda H.
After years of extensive research, ACS 200 has now been shown to achieve complete kill against Borrelia burgdorferi in only 8 minutes. These test results represent a significant feat as the Lyme disease associated microorganism is extremely difficult to culture, test and kill. Most of the Borrelia burgdorferi motility ceased after about 4 minutes of exposure to the ACS 200 solution. No motility was observed after 8 minutes of exposure. Dr. Burgdorfer described similar in vitro testing results using a silver preparation. He surmised that silver disables the enzyme(s) used by bacterial, fungal and viral agents for their oxygen metabolism causing them to suffocate upon contact. There have been reports of elimination of late-stage Lyme symptoms using ACS 200. This data provides the scientific basis for using ACS 200 as an effective anti-Borrelia agent. In the clinical setting, many practitioners currently prescribe ACS 200 to their Lyme patients with excellent outcomes. Adding Advanced Cellular Zeolite (ACZ) nano to reduce toxic body burden is a very powerful adjunct to the ACS 200 protocol. When taken together, these two products are highly effective in broad treatment. Results RNA® distributes their products through licensed, health care practitioners. If you are currently seeing an Integrative Medical Practitioner, I strongly urge you to recommend incorporating ACS 200 and ACZ nano into their clinical practice on your behalf. You may also contact Results RNA® directly and they will help you locate a prescribing practitioner in your area. Results RNA® products are also available from many clinic and natural pharmacy websites online. Dr. Hanshew practiced medicine on the seaside of Seattle for 15 years. She achieved Board-Certified in Family Medicine and Bariatric Medicine. She also has specialized training in Anti-Aging Medicine, Natural Hormone Replacement and Environmental Toxicity issues relating to the exponential rise in the incidence and successful treatment of Autism, Fibromyalgia, ADD, Chronic Fatigue, Multiple Sclerosis, Obesity, Anxiety, Depression and Cancer. 1. Burgdorfer, William. “From Penicillin to Mild Silver Protein-An Answer to Lyme Disease Without Antibiotics”. Rocky Mountain Labortories, Division of N.I.H. 2. Cairns V, Godwin J (2005). “Post-Lyme borreliosis syndrome: a meta-analysis of reported symptoms”. Int J Epidemiol 34 (6): 1340–1345. 3. Singh SK, Girschick HJ (July 2004). “Lyme borreliosis: from infection to autoimmunity”. Clin. Microbiol. Infect. 10 (7): 598–614. 4. Stricker RB (July 2007). “Counterpoint: long-term antibiotic therapy improves persistent symptoms associated with Lyme disease”. Clinical infectious diseases : an official publication of the Infectious Diseases Society of America 45 (2): 149–57. 5. Klempner MS, Hu LT, Evans J, et al. (July 2001). “Two controlled trials of antibiotic treatment in patients with persistent symptoms and a history of Lyme disease”. N. Engl. J. Med. 345 (2): 85–92. 6. Fallon BA, Keilp JG, Corbera KM, Petkova E, Britton CB, Dwyer E, Slavov I, Cheng J, Dobkin J, Nelson DR, Sackeim HA (March 2008). “A randomized, placebo-controlled trial of repeated IV antibiotic therapy for Lyme encephalopathy”. Neurology 70 (13): 992–1003. 7. Krupp LB, Hyman LG, Grimson R, et al. (24 June 2003). “Study and treatment of post Lyme disease (STOP-LD): a randomized double masked clinical trial”. Neurology 60 (12): 1923–30. 8. Feder HM, Johnson BJ, O’Connell S, et al. (October 2007). “A critical appraisal of “chronic Lyme disease””. N. Engl. J. Med. 357 (14): 1422–30. 9. Steere AC, Sikand VK, Schoen RT, Nowakowski J (2003). “Asymptomatic infection with Borrelia burgdorferi”. Clin. Infect. Dis. 37 (4): 528–532. 10. Fahrer H, Sauvain MJ, Zhioua E, Van Hoecke C, Gern LE (1998). “Longterm survey (7 years) in a population at risk for Lyme borreliosis: what happens to the seropositive individuals?”. Eur. J. Epidemiol. 14 (2): 117–123. 11. Smith RP, Schoen RT, Rahn DW, Sikand VK, Nowakowski J, Parenti DL, Holman MS, Persing DH, Steere AC (March 2002). “Clinical characteristics and treatment outcome of early Lyme disease in patients with microbiologically confirmed erythema migrans”. Ann. Intern. Med. 136 (6): 421–428. 12. Auwaerter PG, Aucott J, Dumler JS (January 2004). “Lyme borreliosis (Lyme disease): molecular and cellular pathobiology and prospects for prevention, diagnosis and treatment”. Expert Rev Mol Med 6 (2): 1–22. 13. Steere AC, Dhar A, Hernandez J, et al. (January 2003). “Systemic symptoms without erythema migrans as the presenting picture of early Lyme disease”. Am. J. Med. 114 (1): 58–62. 14. Dandache P, Nadelman RB (June 2008). “Erythema migrans”. Infect. Dis. Clin. North Am. 22 (2): 235–60.Stanek G, Strle F (June 2008). “Lyme disease: European perspective”. Infect. Dis. Clin. North Am. 22 (2): 327–39. 15. Chabria SB, Lawrason J (2007). “Altered mental status, an unusual manifestation of early Disseminated Lyme disease: A case report”. Journal of Medical Case Reports 1 (1): 62. 16. Shadick NA, Phillips CB, Sangha O, et al. (December 1999). “Musculoskeletal and neurologic outcomes in patients with previously treated Lyme disease”. Ann. Intern. Med. 131 (12): 919–26. 17. Seltzer EG, Gerber MA, Cartter ML, Freudigman K, Shapiro ED (February 2000). “Long-term outcomes of persons with Lyme disease”. JAMA 283 (5): 609–16. 18. Hess A, Buchmann J, Zettl UK, et al. (1999). “Borrelia burgdorferi central nervous system infection presenting as an organic schizophrenia-like disorder”. Biol. Psychiatry 45 (6): 795. 19. Puius YA, Kalish RA (June 2008). “Lyme arthritis: pathogenesis, clinical presentation, and management”. Infect. Dis. Clin. North Am. 22 (2): 289– 300, vi–vii. 20. Mullegger RR (2004). “Dermatological manifestations of Lyme borreliosis”. Eur J Dermatol 14 (5): 296–309. 22. Lo Re V, Occi JL, MacGregor RR (April 2004). “Identifying the vector of Lyme disease”. Am Fam Physician 69 (8): 1935–7. 23. Steere AC (July 2001). “Lyme disease”. N. Engl. J. Med. 345 (2): 115–25. 24. Puius YA, Kalish RA (June 2008). “Lyme arthritis: pathogenesis, clinical presentation, and management”. Infect. Dis. Clin. North Am. 22 (2): 289–300, vi–vi. 25. Tylewska-Wierzbanowska S, Chmielewski T. (Jul 2002) “Limitation of serological testing for Lyme borreliosis evaluation of ELISA and western blot in comparison with PCR and culture methods”. Wien Klin Wochenschr 114(13- 14):601-5.